If you are taking a trip to the historic Lundy’s Lane in Niagara Falls soon, you might notice a new but familiar place amongst the shops, restaurants and hotels. On September 23, 2015 Canada wide chain Boston Pizza opened its doors at the Americana Waterpark Resort. 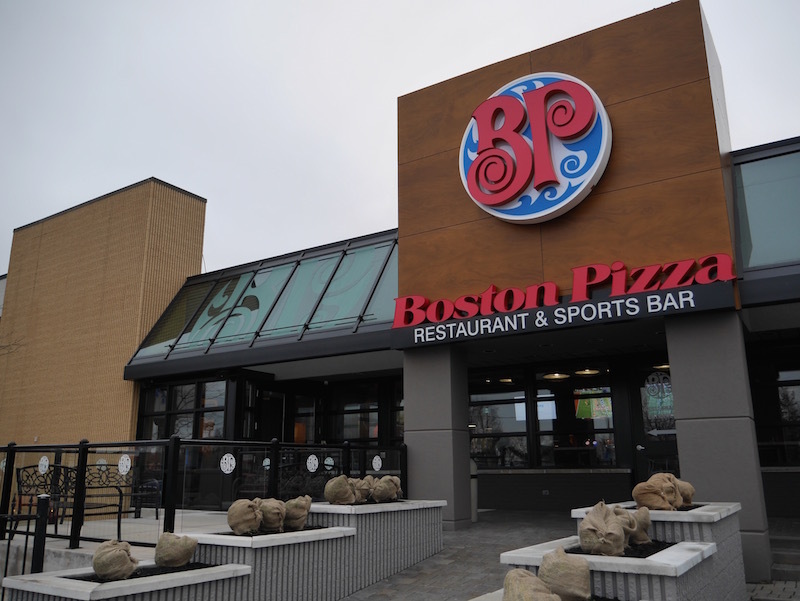 Whether you are staying on Lundy’s Lane or anywhere in the Falls, here’s what you need to know about the newest Boston Pizza Niagara Falls, Boston Pizza Americana. When I heard about the new Boston Pizza Americana, I knew we had to head to Niagara Falls and check it out. Will and Charlie love the chain and always ask to stop in for lunch when we see one. I particularly love what Boston Pizza does for the local communities in which it operates. I was pleased to see that since opening, the Boston Pizza Americana has already donated more than $3,000 to the local Boys and Girls Club of Niagara Falls. We headed to Boston Pizza this past Saturday for a pyjama and pizza party. The kids were welcomed with open arms in their jammies. As I looked around the restaurant, I had to chuckle at how many other families had done the same thing. I’m guessing the casual vibe of Boston Pizza is what drove us all to decide that pyjamas at dinner would be an added treat. This Boston Pizza features a welcoming 100 seat dining room and an almost equal size sports bar. For the summer months, there is also a 58 seat outdoor patio. The bartender kindly set one of the televisions to Frosty the Snowman, while I was able to watch hockey and enjoy a night off from cooking. We ordered quickly knowing exactly what the kids wanted and the food came quickly enough to please my hungry broad. Charlie happened to mention that she had a dairy allergy and the server was wise enough to ask her not to eat until she double checked that it was safe. 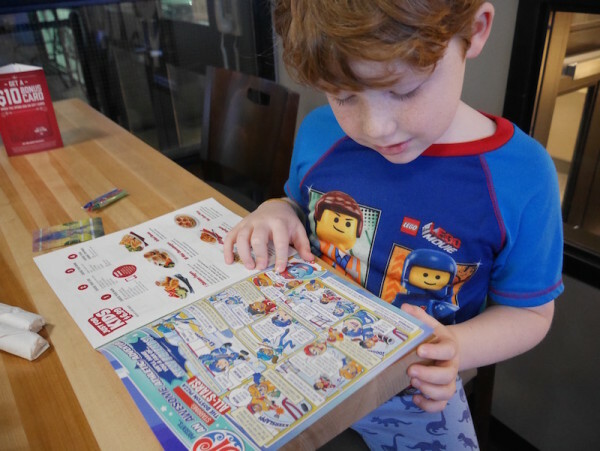 I was really pleased when she brought out a binder of allergens and told Charlie due to the presence of milk in the chicken fingers, she would switch her meal to something else. Within minutes, Charlie was enjoying a fresh made hamburger while I breathed a sigh of relief. I couldn’t decide what to eat off of the more than 100 items on the menu and ended up ordering a selection of appetizers and a fresh pasta dish. Our server recommended the Boston Pizza Bandera Bread which I had never tried and absolutely loved. We couldn’t finish our meal without what is probably Will’s favourite dessert anywhere, the Panookie. If you haven’t had this pan baked cookie topped with ice cream and chocolate sauce, go now. You won’t regret it. Our meal was fantastic but the service we received was even better. Everyone we spoke to was pleasant and extremely helpful. They checked out the kids drawings and told me all about the area. When we visit Niagara Falls, we will return to this Boston Pizza again and again. 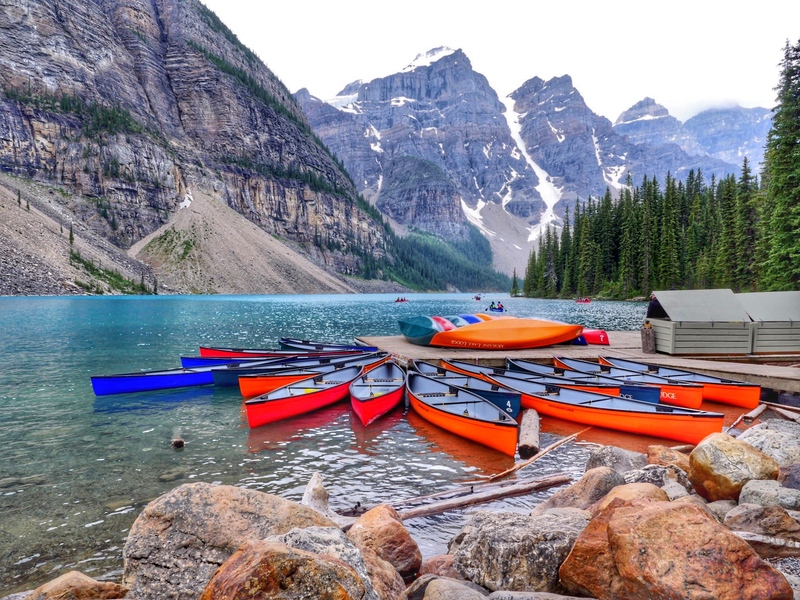 No matter where you are in Canada, there is probably a Boston Pizza nearby. The restaurant chain now has more than 365 locations and serves over 40 million guests annually. If you do head to check out the new Boston Pizza Americana, make sure to bring your swimsuits. Inside the resort, next to Boston Pizza is Waves, an indoor waterpark. 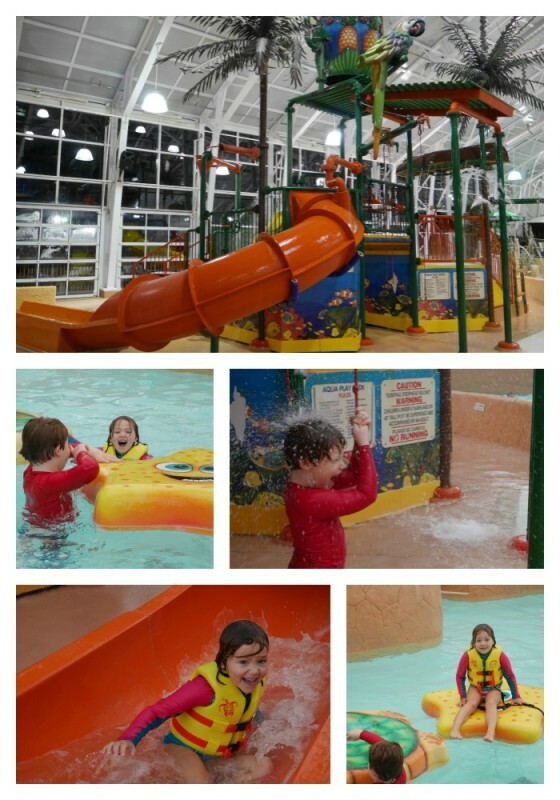 The 25,000 square foot facility is filled with fun activities for families including 4 large slides, a kid’s playground with water slides, and a section for babies. Most notably, Waves has one of the best wave pools we have tried. The waves are frequent and quite large so make sure to grab life jackets for weaker swimmers. We loved having a dance party in the waves, tubing together down the slides and I even got to sneak away and enjoy the hot tub for a few moments of peace and quiet. 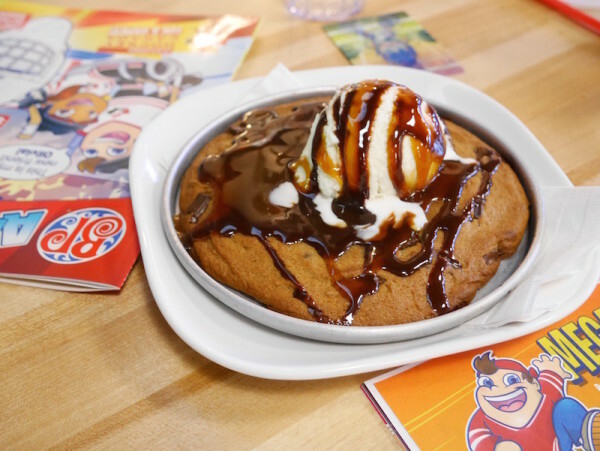 Whether or not you are staying on Lundy’s Lane or just feel up for a day trip from Toronto, Boston Pizza Americana is a great pick. The restaurant is open for lunch and dinner daily. 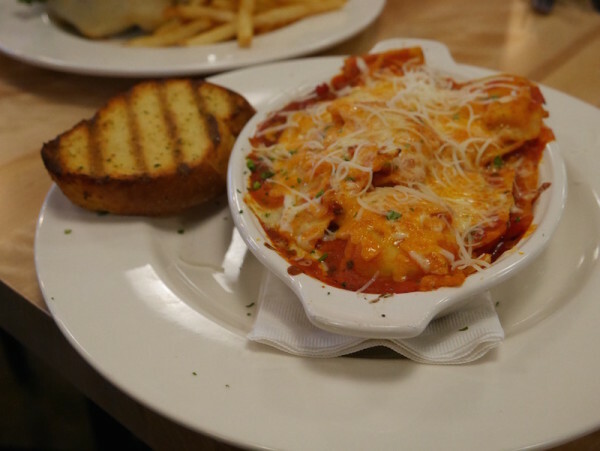 If you are in Niagara Falls, the restaurant is also a stop on the WeGO Niagara Falls bus line which means mom and dad can even enjoy a drink from the bar during dinner. The WEGO is one of my favourite lesser known features of Niagara Falls with a 24 hour pass costing just $7 for adults and $4 for kids with children under 5 riding for free. When you do go, make sure to order the Panookie. Seriously, you need to try it.